Our customers in Lower Saucon Township just outside Bethlehem in the Lehigh Valley have made a commitment to place oriental rugs throughout the entire first floor area of their home. 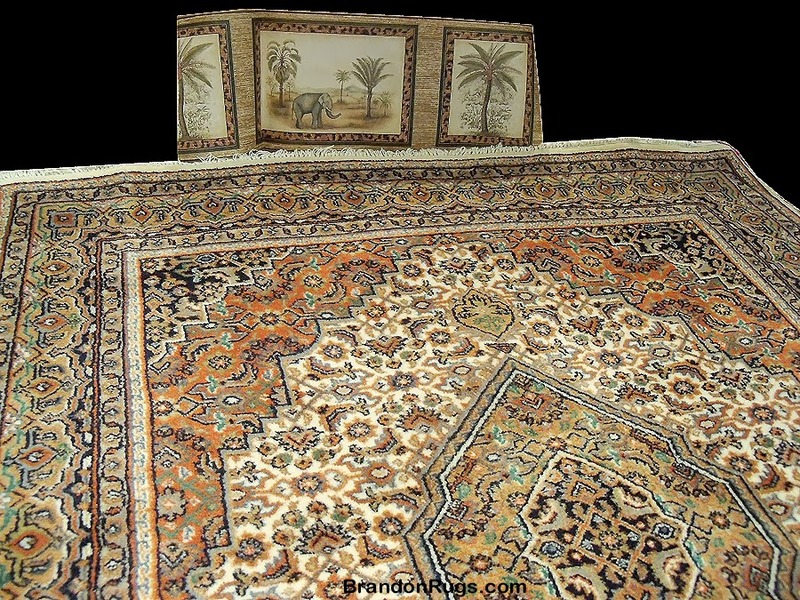 Because of the scale of the improvements they're undertaking thoughout the home, there is a budget set for each project which they asked Brandon Oriental Rugs (www.BrandonRugs.com) to honor as we assist in the rug search. 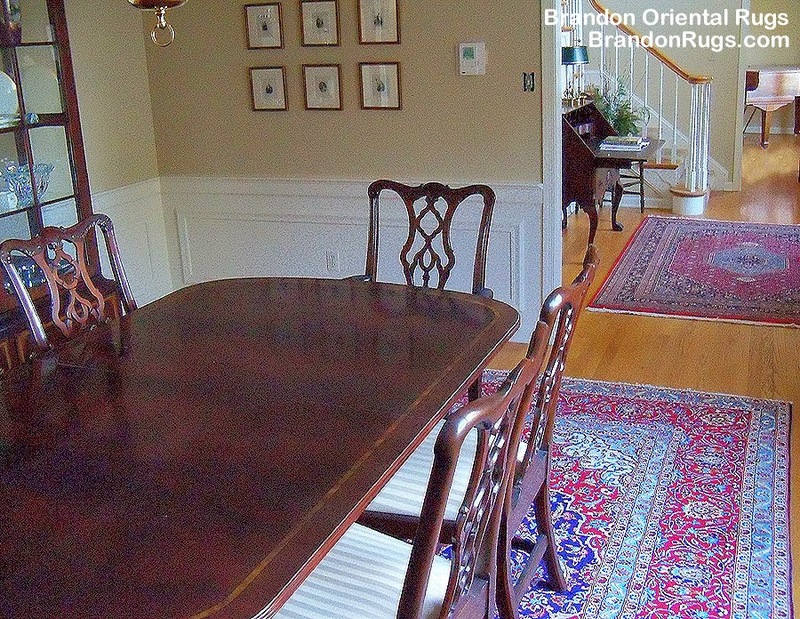 Having recently inherited some antiques from family, and purchased a new dining room suite from Hendrixson's Fine Furnishings in Shimersville, PA, their first objectives were to find good quality hand-knotted rugs for the dining room and adjacent entry hall. On a visit to the home, it was found that both dining room and entry hall had special size requirements in order for any rug to function correctly. The entry hall required 6x8 (and could not accept standard-size 5x8 or 6x9. The dining room needed 10x13 since standard-size 9x12 or 10x14 would not work.) 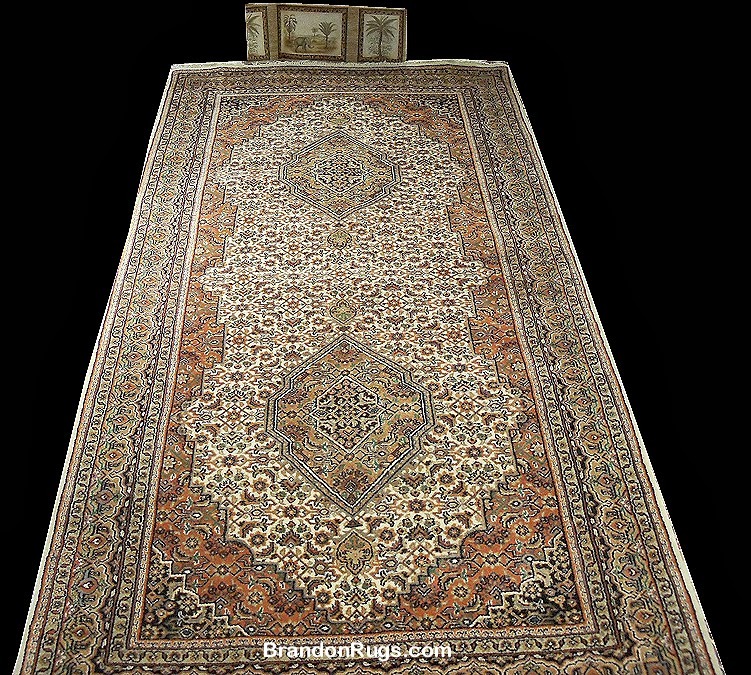 We were able to find an attractively priced Persian Kashan for the dining room (which - because it is made using metric standard - was 3x4 meters or 9'9 x 13'0".) The entry hall was more of a challenge, but we were able to find a 6x8 Bidjar design rug made in India that satisfied the needs and preferences of our customer. Our customers in New Hope, Pennsylvania are a lovers of fine quality oriental rugs, and asked us to help find "a Persian rug masterpiece" to be positioned directly next to a sauna room on a tiled floor leading into their master bathroom. We were asked by an interior designer, whose business serves Bucks and Montgomery counties and other areas of southeastern Pennsylvania, to assist her on a small project by finding a "custom size" oriental rug to complete a hallway. 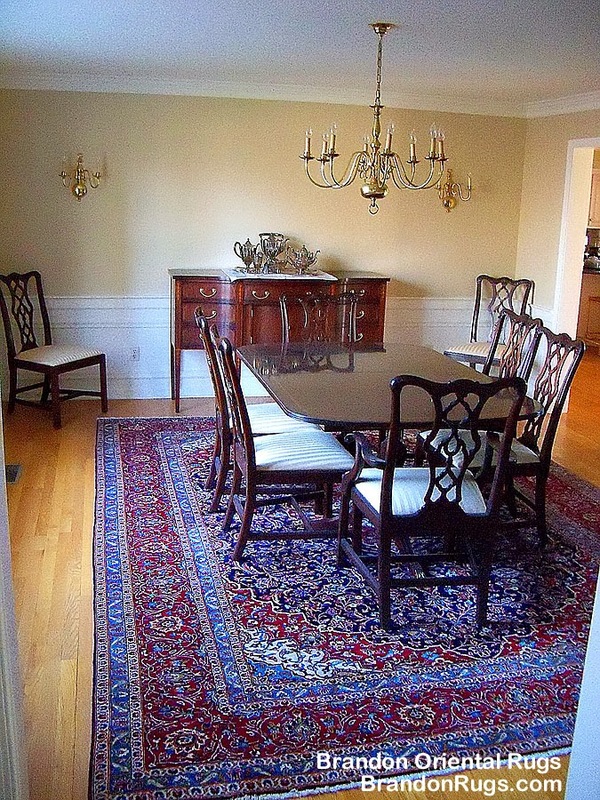 The rug had to be 4'x8'; geometric or rustic in style; and had to coordinate with existing wallpaper that covered the walls above the wainscoting. What she believed to be a "custom size" rug is actually an available standard size in real, hand-knotted oriental rugs. Room arrangements in traditional Middle Eastern and Iranian homes require rugs which are placed at the ends of a large main carpet in the room; and which are usually twice as long as they are wide (e.g: 4x8, 5x10, 6x12). They are called kellegis. Brandon Oriental Rugs (www.BrandonRugs.com) was able to find the rug shown here - a 4x8 Persian Bidjar design kellegi made in India - to satisfy the requirements of the designer's project, and to provide her client with the look and quality that no machine made carpet or imitation oriental rug could possibly offer. In analyzing search engine results, we recently ran a cross-check on the price of a rug we had just sold to a customer in Newtown, PA compared with prices for similar rugs online at the Pay-Per-Click E-tailers that you find at the top of every search related to "rugs". The evidence is here and mounting for those shopping for oriental rugs within a fifty mile radius of Central Bucks County, Pennsylvania (including Central New Jersey and the Lehigh Valley) that internet Rug E-tailer "Best Price" -- and other "best-of-everything" -- claims are NOT real or true. Better prices and more convenient service is available from a local bricks-and-mortar store (Brandon Oriental Rugs) just outside Doylestown, PA and within minutes of New Hope, Newtown, Peddlers Village and other communities and destinations in the metropolitan Philadelphia region. rug E-tailer found in the results of many rug searches. You can see the price. or nearly 38% better than the "Best Price" offer found online! Mass-production rug makers, and "rug sale" e-tail websites are using all the marketing science and advanced algorithms available to engage bargain-hunting rug-shoppers online. They have a BIG (virtually ubiquitous) presence in pay-per-click and organic search engine results relating to "oriental rugs", "handmade rugs", "area rugs", "antique rugs" and the like. And their sites are scientifically developed and tested to assure expeditious funneling to the checkout page. All seem to make claim to offering "the lowest price"; providing "the best of everything"; and having earned the "highest customer ratings". With a perfunctory page or two of "What You Need To Know" information about the purchase of an oriental rug -- a purchase that could gratify (or gall) you for years and years to come -- these venues try to seal-the-deal with offers of "free shipping", "risk-free purchase and return", and "lowest price guarantee". Unfortunately for the rug buyer (who ought to beware, unless the rug item under consideration has an associated SKU# related in fact to something that has actually been seen), there is no way from browser pictures to truly appreciate what you are buying; or to grasp from the data which is shared much that is meaningful so that meaningful comparisons can be made. And the mass-producers and the E-tailers compound the problem by using "branding" to mask the underlying qualities of their offerings. "Rug Quality A" is hand-knotted in India with 80 knots per square inch, and with a heavy wool pile on double-weft cotton foundation. It is widely produced by many importers and can be found in bricks-and-mortar establishments nationwide in many different designs and colorways for a price point that ranges from $18 to $22 per square foot depending on location and store policy. 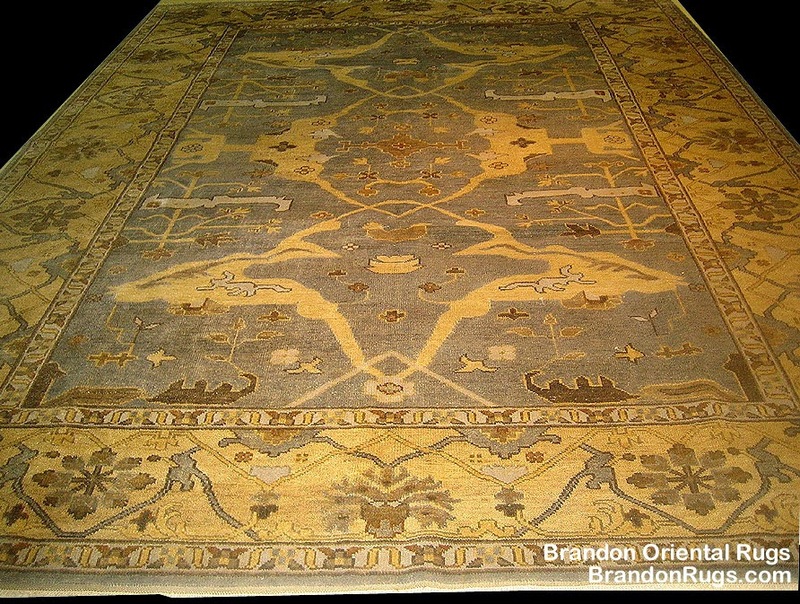 Mass-Producer One, Inc. produces "Rug Quality A" and offers it branded as "Golden Orchid". The exact same "Rug Quality A" is also made by Mass-Producer Two, Inc. which brands it as "Carnation". If you've read this far, we commend your interest. You can appreciate that "branding" (the darling of marketing, and rush-to-the-finish-line E-tailing) is not helping you to get the information that matters about a consequential purchase (even if you go "cheap"). Maybe you are like us (that's the algorithm we use for our business operations), and appreciate maximum degrees of freedom in your shopping experiences. You want to know more about what you are buying so that you can compare one item with another, and really get a sense of where value truly is. You want to see things that are unique, and uniquely suited to your tastes and purposes, rather than being channeled to acceptance of the common offering for your demographic, or what some taste-maker has proclaimed someone like you will necessarily want. In fact, you want the satisfaction of doing something special; knowing that the person in line behind you can't do the same thing. You want to know what is truly available to you, and not just what's available in the latest catalog. You might truly welcome and enjoy the experience of looking for your rug through our service (or services like ours wherever they can still be found). We are dedicated to helping you find what really works for you, and what will give you a real, enduring sense of satisfaction and accomplishment. We certainly invite, look forward to, and hope to reward your call or visit. And we invite you to consider: The people helping you in your local rug store know they will be facing you over and over again in the places you live, work and play. They jealously guard their reputations so that they can forever look you in the eye and engage you cordially. That's a level of protection of your trust that no website can truly offer.